Doodle + Code designed and developed Büro's brand identity, collateral, signage, marketing materials, and online presence to reflect the modern nature of this forward-thinking co-working space. Doodle + Code established the brand to resonate with the client’s target audience; it communicates the light, fresh, and casual personality of Büro while defining the company’s goal of thriving productivity and networking. As the company expanded, so did their website; location-specific landing pages were created with a strategically designed hierarchy of information to convert visitors to leads. Visually dynamic, each location is supported with attention-grabbing photography that reflects the true nature of the entrepreneurs that work in Büro’s office spaces. Multiple sales collateral, signage, and marketing materials were developed to work cohesively with the brand. Responsive and designed to work seamlessly between desktop PCs, mobile devices and tablets. Büro provides co-working office spaces for the creative and energetic community of entrepreneurs and creators. Smart and talented people from diverse industries are brought together in Büro’s co-working office spaces to form a powerful and inspiring community. 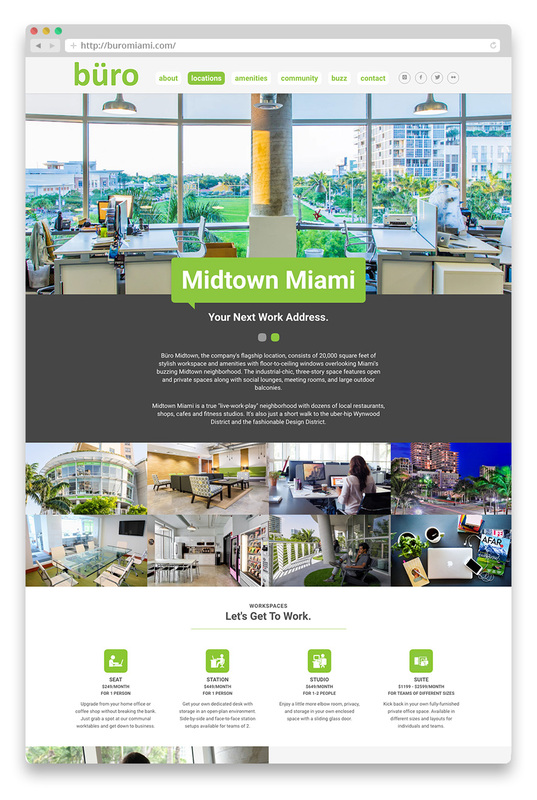 Büro has grown to include over 300 companies across 4 South Florida locations (Midtown, South Beach, MiMo, and Coconut Grove) and each of the spaces reflect the brand’s enthusiasm, efficiency, and innovation.